—Rev. Gary Davis at the Gaslight in December 1970, during a performance by David Bromberg. The legacy of the Rev. 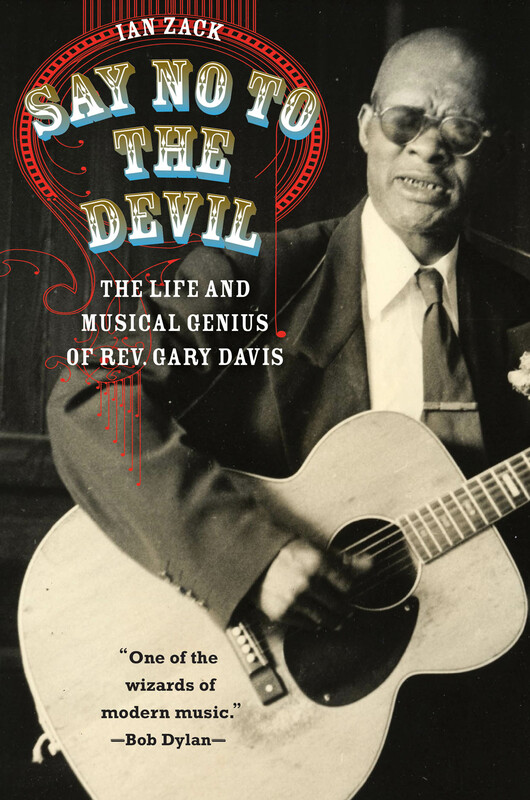 Gary Davis is the songs he wrote and recorded, the covers of those songs by numerous musicians, but above all in and through the students whose music and lives he shaped. Well over a hundred young guitarists showed up at his New York door in the sixties and early seventies, and the Reverend, with very few exceptions, showed them inside. Ian Zack interviewed many of those students for his biography, Say No to the Devil: The Life and Musical Genius of Rev. Gary Davis. Allen performs under the name Mr. O'Muck. Opened for Davis at one of his last Greenwich Village concerts. A performer and teacher of the sarod, who studied with Davis for three years. Lived with the Davises for a year about 1970; later known as Laz Lawrence Brezer and a noted dancer in Japan. An especially talented student, Davis and Buchanan grew very close, with the Reverend later introducing him to his black church congregations as “my white son.” Buchanan taught the Davis guitar style to some of his fellow students at Antioch College including Jorma Kaukonen (later of Jefferson Airplane and Hot Tuna) and John P. Hammond, son of the famed Columbia Records producer. Lead boy, briefly, for Davis. Had lessons with Davis in between Davis’s performances at the Ash Grove folk club in Hollywood. Youtube: A Skip James song “Cherry Ball Blues” from 1972. First curator of the Rock and Roll Hall of Fame. Youtube: Davis song “Buck’s Dance” (with intro). DiMucci is best known for his Top 40 hits recorded with the rock ’n’ roll group Dion and the Belmonts. Youtube: “That’s Where It’s At”, accompanied by some old Bronx film footage. A student who lived with the Davises in the early seventies. One of Davis’s final guitar pupils. A week or two before his death Davis gave him a two-and-a-half hour lesson, and then wanted to arm wrestle. Founded Arbiter Records. Forman was active in the Camridge folk scene and played guitar on at least one Joan Baez recording. He died in 1966. One of the best-selling bluesmen of all time. Fuller and Davis were both street musicians in Durham, North Carolina. After Davis moved to New York, Gibbon was his first one-on-one guitar student and “lead boy” in New York; later became a psychiatrist. Studied with Davis for three years. Grossman’s Guitar Workshop carries on the teaching of Davis’s music and musical style. Came to New York to study with Davis straight out of high school in Pittsburgh. Student of Davis as a precocious fourteen-year-old singer-songwriter from East Orange, NJ, who was named Janis Fink at the time. Youtube: Talks about his early career and lessons with Davis. Guitarist with the Blues Project and cofounder of Blood, Sweat, and Tears. Youtube: The Blues Project recording of “Steve’s Song” from 1967. Mann was twelve when his mother took him to the first of four years’ worth of lessons. A Canadian student; drove Davis to visit Woody Guthrie in Brooklyn State Hospital in 1964. After his ninth grade year at Winship Junior High in Detroit, he lived with the Davises in the summer of 1964. Townley was a student and the driver of the first car Davis bought in 1963. Later became a record producer and recorded Davis’s O, Glory: The Apostolic Studio Sessions. Youtube: “Shine On” from 1979. The Mayor of MacDougal Street; a fixture in the Greenwich Village folk revival. Guitarist for the Grateful Dead, etc. Youtube: Davis song “Samson & Delilah” with the Grateful Dead in 1978. A black folksinger and one of Davis’s few black students in New York. Youtube: “My God Is Real” from 1969. Blind Gary Davis A short documentary by Harold Becker filmed in the Bronx and Harlem in 1962. Davis appears on Pete Seeger’s Rainbow Quest The full episode of the television program (1964 or ’65) also includes performances by Donovan and Shawn Phillips. Twenty-five minutes of a video recorded in a Seattle television station in 1969. Includes: “Twelve Gates to the City,” “Samson and Delilah,” “Slow Drag/Cincinnati Flow Rag,” “Candy Man” (instrumental), “Sally Where’d You Get Your Liquor From,” “Buck Dance,” “Wouldn’t Say Quit,” “Oh Glory How Happy I Am,” and “I Heard the Angels Singing” (partial). “Death Don’t Have No Mercy” recorded at the 1965 Newport Folk Festival. Many more are available online.